Hey there, I guess it’s been a while! Life just went super busy with finishing up my degree, but after packing away my sewing machine for a couple of months I’ve been back to more regular sewing since the beginning of May. I have different things under my machine right now, and I’m stopping by to show you my first finish post-hiatus: a baby quilt for my cousin’s newborn boy. Since I didn’t have a lot of time from start to finish I wanted a simple layout I could sew up quickly. I’ve been drawn to the look of Quarter Square Triangles lately and I find them super simple to put together. So a simple QST quilt seemed like a good fit. 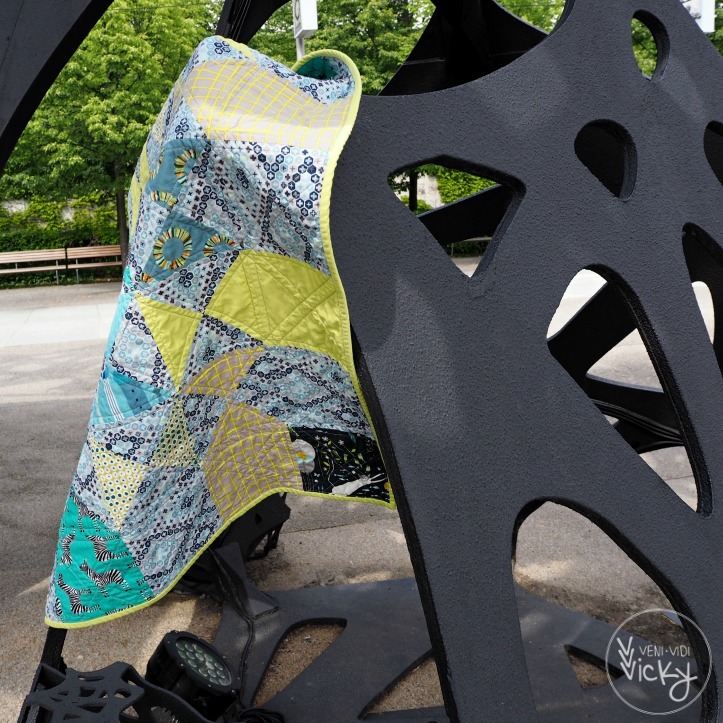 Fabric used is a wild mix of Tula Pink, Lizzy House and Robert Kaufmann prints, mixed in some Cotton and Steel and a citron-y Kona Cotton I’ve learned to love (cactus? not sure). I had plans to make a simple border just using big strips of the Tula Pink Seawater blue-greyish fabric, but once I had pieced the inner panel, the Tula pattern seemed overwhelming if used in such big quantities. 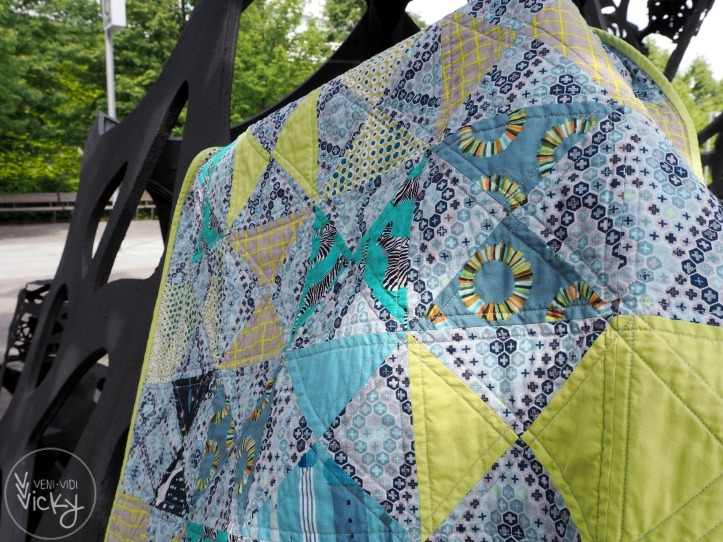 Thus the border was pieced using coordinating squares of the outer triangles. 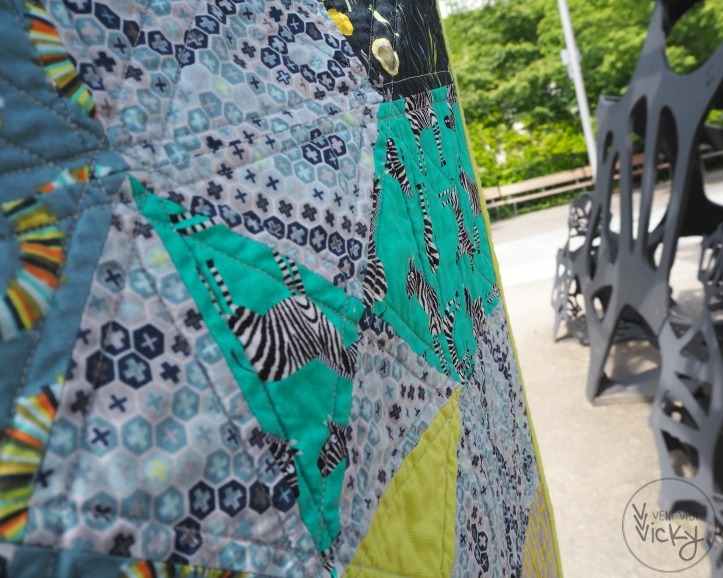 The border now seems to be forming arrows pointing to the middle of the quilt, which prompted the name of this baby quilt “Wherever You Will Go”. I’m slowly learning to embrace quilt-making as a process, where not everything can be planned in advance. The quilting is done in straight lines echoing the seams with a 3/8” offset. I might have opted for a denser grid, but was running out of time to get it done, washed and photographed in time before gifting it to its little owner yesterday. I love the little cats, zebra and balloon sneak peaks and the fresh colour palette. Missed you too! 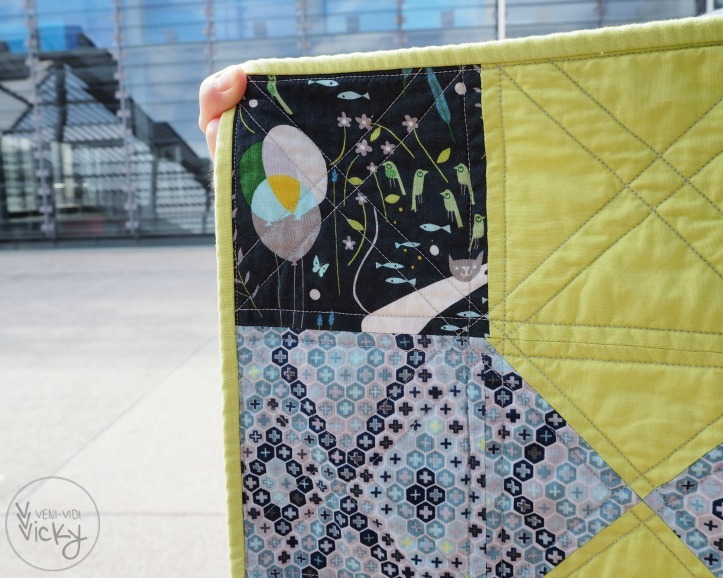 :-) love the baby quilt, what a lucky little guy! Hey Janine, thank you so much for your lovely comment! You’re back!!!!! WOOO!!!!! Hope all went well with your paper in the end. I too have been big into the idea of QSTs. Hopefully I’ll get to do something with them soon. And I think the idea of creating the arrows was/is brilliant! Amanda!! It was about time, right?! The thesis was very well received, thank you for thinking of me. Please make something with QSTs, I know it will be awesome if you do! It’s beautiful. Any new mum would be thrilled to receive it! That zebra fabric is darling! And I love the happy accident of the border forming arrows, how fun. 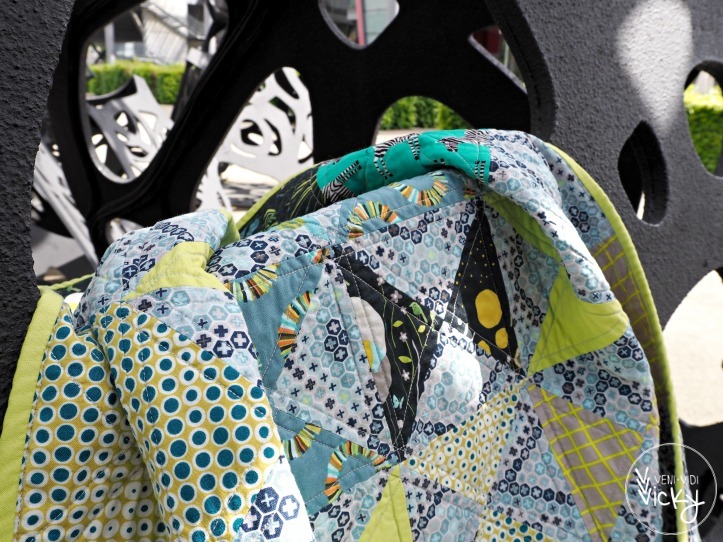 :) Such a lovely little quilt, I’m sure it will be much appreciated! I really like the fabric choice as well as the squared border. Welcome back! Lovely baby quilt! I need to make a couple for myself also! Thank you so much =) I love making baby quilts for friends and family, perfect excuse to play with fabric and use cuter prints! 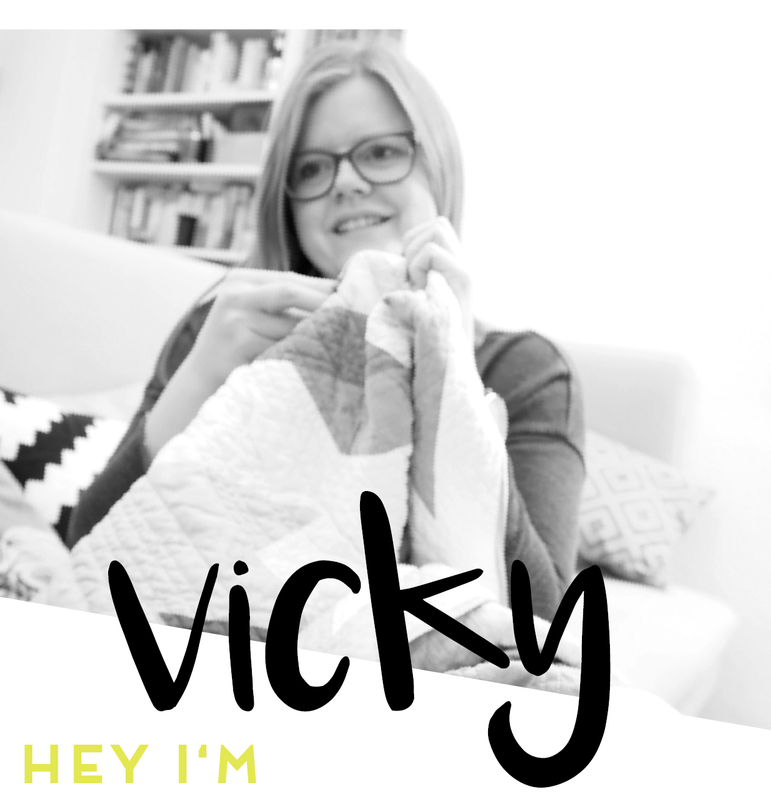 Hi Vicky – I love this quilt! The prints are really fantastic and your pictures are lovely. And you are right – we’ve both used Kona Cactus in our finishes this week! :) Thanks so much for linking up with TGIFF! 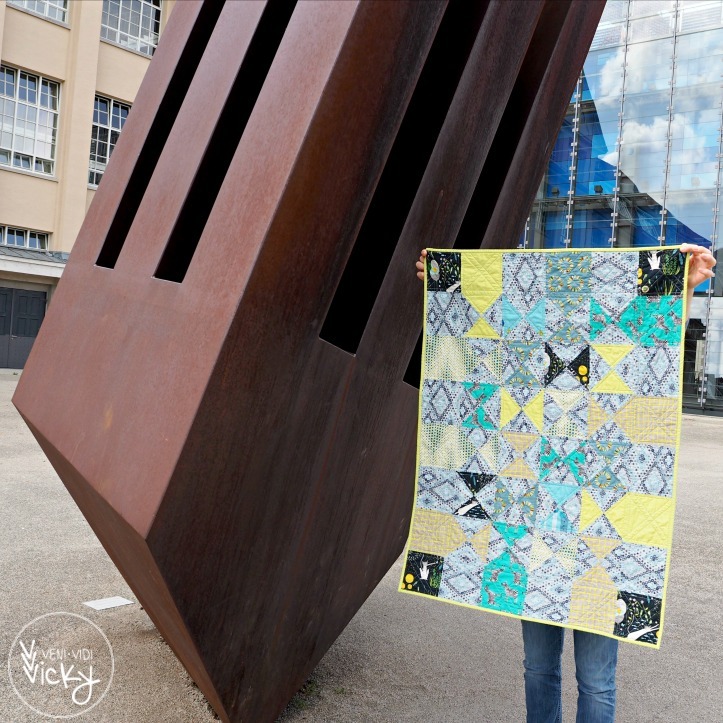 Well done, it’s a beautiful quilt photographed in a beautiful setting! Thank you so much Daniela! 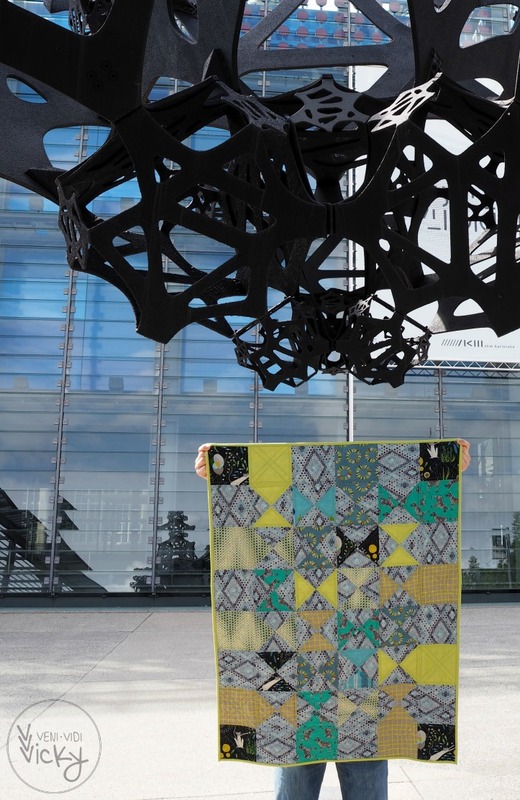 It’s a longterm outdoor sound installation in front of the Technology in Media Museum in Karlsruhe.